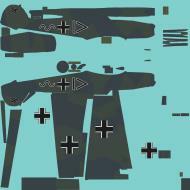 Profiles:00 Messerschmitt Bf 109E.3 Oblt. Werner Pichon-Kalau von Hofe, Technical Officer III./JG51 Oblt. Werner Pichon-Kalau von Hofe's Bf 109E-3 W.Nr 1490 as it appeared during the mid-summer of 1940. Finished in a high demarcation 70/71 camouflage scheme it carried the III.Gruppe 'Axt van Niederrhein' beneath the cockpit ledge. Photo 01: This Bf 109E-3 belonged to the Technical Officer of III./JG51 is being refueled at a temporary landing strip in France shortly after Dunkirk. Photo 02: Bf 109Es of III./JG51 on an unidentified French airfield in the early summer of 1940. The aircraft in the middle foreground is that of the Technical Officer, Oblt. Werner Pichon-Kalau von Hofe W.Nr 1490. 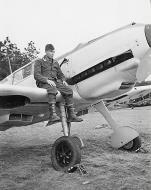 The black cat emblem on the cowling of the aircraft in the foreground is that of 8.Staffel which had been 2./JG20 before it became a part of JG51. Both aircraft are finished in the high demarcation 71/02/65 scheme. Photo 01: Tense personnel of Stab/JG54 anxiously await the return of an overdue pilot. In the foreground left, still wearing his life jacket is Oblt. Pichon-Kalau von Hofe, Hptm. der Reserve Waldhausen, and the Kommodore, Major Hannes Trautloft. Several members of the ground staff are in the background. The missing pilot, Oblt. Otto Kath had become separated from his Schwarm during a mission over England but eventually returned unharmed. 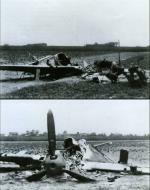 Photo's: Show the crash remains of Messerschmitt Bf 109E1 1./JG20 (W9+) flown by Wilhelm Otterbeck who was shot down over Middelburg Holland on 17th May 1940 by a Hawk 75A of GC I/4, piloted by French pilot Lt J. Hirschauer. Remarks: POW 11 May, 1940 after being hit by Dutch AA fire. 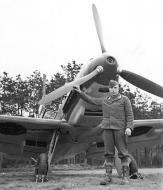 His 109 crashed at Amerongen Holland (DeSwart), near Tiel. He sat out the rest of the war in Canada after being quickly sent to England from the Netherlands. Nickname 'Minni'. Remarks: One known victory, his 1st, a Hawk-75A south of Middelburg, 17 May, 1940. His 2nd, a Spitfire SW of Dover on 8 August, 1940. His 3rd, a Spitfire S of London on 18 August, 1940. His 4th, a Spitfire near London on 7 September, 1940. His 5th & 6th, a Hurricane and a Spitfire near London on 15 September, 1940. His 7th, a Spitfire over the Thames on 11 November, 1940. His first known Soviet victory, while in JG-51, an Il-2 on 4 August, 1942. An Il-2 on 5 August, 1942. An Il-2 on 10 August, 1942. An Il-2 E of Kuklovo on 5 September, 1942. An Il-2 on 29 October, 1942. An Il-2 on 11 May, 1943. A Boston on 6 July, 1943. A LaGG-5 on 8 July, 1943. A LaGG-5 on 16 July, 1943. Two Yak-9's E of Oescha on 12 October, 1943. A Boston III at Retschiza on 28 October, 1943. A Soviet P-39 on 29 September, 1944. A LaGG-3 and a P-40 on 8 October, 1944. An Il-2 (m.H.) on 11 October, 1944. Two Yak-9's on 21 October, 1944. Bowers/Lednicer, 39 victories. Remarks: MIA 23rd April 1942 in Werk# 7465 near Tolsstowa, S.U. He did return shortly thereafter. Each of the other AC did receive damage in other encounters. In one, on 16 March, 1941, he was wounded in # 5909 near Le Mans. His first known victories, Nos.1, 2 & 3, all Defiants S of Folkestone on 19 July, 1940. His 4th a Spitfire near Tonbridge on 12 October, 1940. His 5th a Spitfire in the London area on 25 October, 1940. His 6th a Spitfire at Ashford on 27 October, 1940. His first known Soviet victory, an I-18 on 16 February, 1942. An I-26 on 12 March, 1942. Five victories on 16 March, 1942; an I-18, two R-Z's, and 'Unident' and a 'Doppeldeck'. A P-40 on 21 March, 1942. A P-40 on 11 May, 1942. A MiG-3 on 15 June, 1942. Deceased 24 September, 1999.